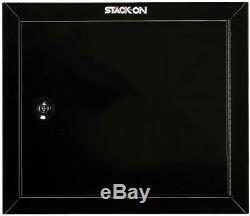 Stack-On GCB-900 Steel Pistol/Ammo Cabinet, Black. 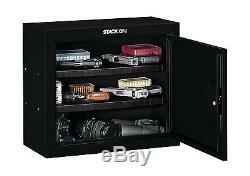 The stack-on Tactical gun cabinet is the safest way to store your guns. Designed with the Usability and comfort of all gun enthusiasts, stack-on does not sacrifice cost for quality. This stack-on cabinet is approved by the California department of justice as meeting their standards for safely storing firearms. Full length welded and staked steel piano hinge provides greater security. Also features Stack-On's patented, contoured non-marring barrel rest and barrel standoffs for scoped guns. Durable baked epoxy finish in black. Pre-drilled mounting holes allow easy attachment to the floor or wall. Fastening and finishing hardware included. Pre-drilled top mounting holes align with Stack-On's Pistol/Ammo Cabinets. Stack-On's superior all steel 3-point locking system provides greater security. The locking plate passes behind the steel cabinet frame at the top and bottom of each unit. In addition, a large steel locking plate is secured behind the steel door frame in the center section of the door panel. Locking mechanism passes through steel door and is secured. Units are fully lockable with key coded, double-bitted lock. Two removable shelves and foam padded bottom provide ample storage. Pre-drilled mounting holes allow for easy attachment to floor, ceiling, wall or other Stack-On pre-assembled gun cabinets. Item Weight: 24.9 pounds. Product Dimensions: 10.5 x 21.5 x 21 inches. The item "Gun Cabinet Pistol Ammo Vault Handgun Storage Safe Stack On Gunvault Steel Safes" is in sale since Sunday, November 6, 2016. This item is in the category "Sporting Goods\Hunting\Gun Storage\Cabinets & Safes".